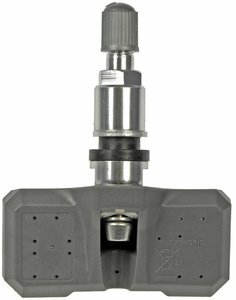 Dorman's Tire Pressure Monitoring System (TPMS) Sensor features a unique two-piece design that allows for replacement of the valve stem independently of the sensor. The sensor also offers an adjustable angled stem, so an exact fit is ensured. Likewise, proper function is ensured: though the look and color of the sensor may vary from the factory-installed one, the internal electronics are customized for your specific vehicle, and will provide the same service as the original.